Rodney Carriker shovels charcoals onto his Dutch oven cookers on Saturday, making sourdough rolls for the La Plata-Archuleta Cattlemen Chuckwagon Cook-Off. Crowds gather every year for an authentic, late-nineteenth century meal. 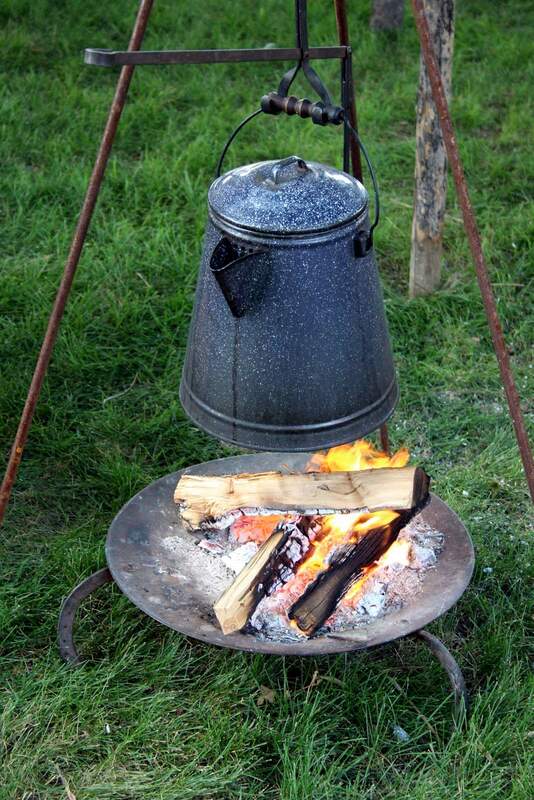 The Durango Cowboy Church crew keeps an authentic pot of coffee going over a campfire. 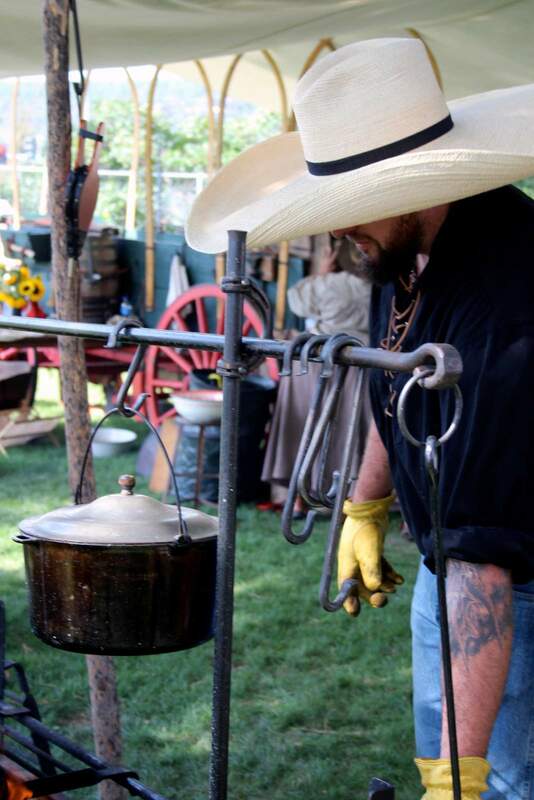 Cody Batchelor prepares to stir a pot Saturday in the Durango Cowboy Church camp. Rodney and Kristie Carriker’s sourdough rolls are just starting to brown Saturday toward the conclusion of cooking time. About 400 people attended Saturday’s annual chuckwagon cook-off, served under the cottonwood trees at the La Plata County Fairgrounds. 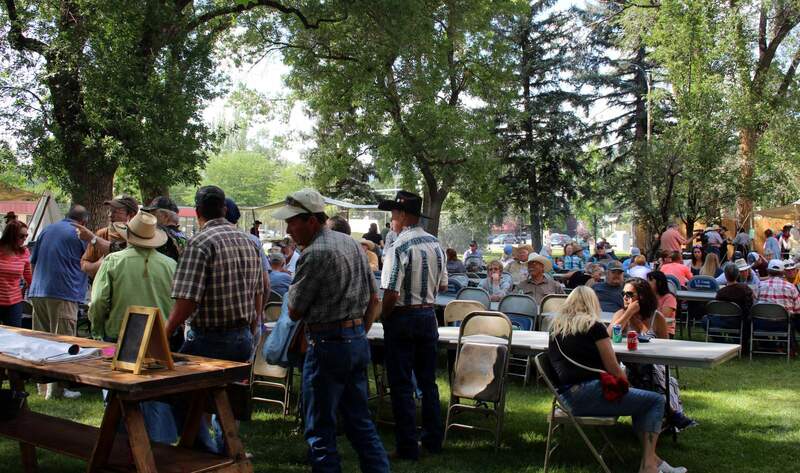 Fifteen local volunteers gather to judge meat, beans, potatoes, bread and dessert at Saturday’s chuckwagon cook-off hosted by the La-Plata-Archuleta Cattlemen Association. Olathe sweet corn, Palisade peaches, Bayfield farmers market tomatoes – as a food lover, this is one of my favorite times of year. 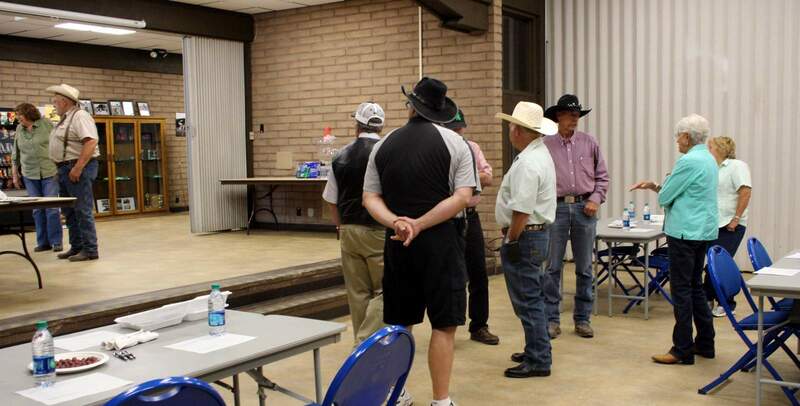 Another highlight is when the organizers of the La Plata-Archuleta Cattlemen Chuck Wagon Cook-Off call the newspaper office seeking judges for their events. Unless I’m out of town, I always try to come help out. Before the judging begins on Saturday night, I like to visit the campsites and take photos. 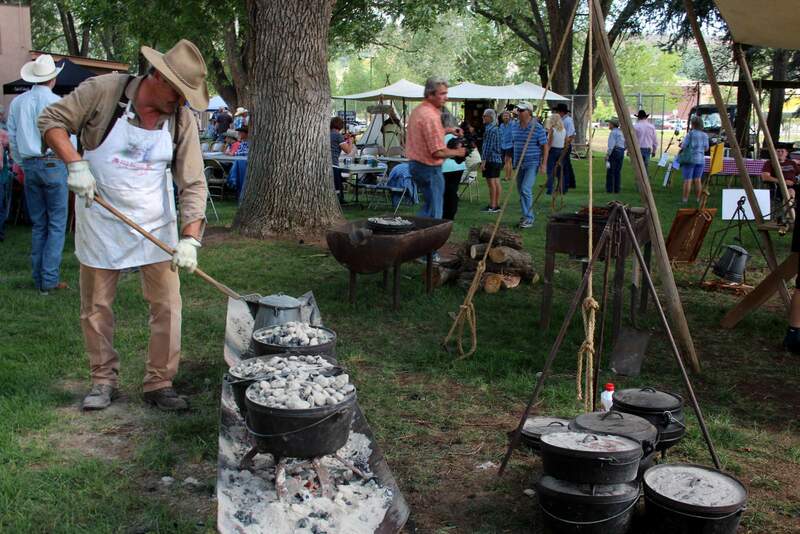 Chuck wagon cooking is an all-day affair and lots of hard work. 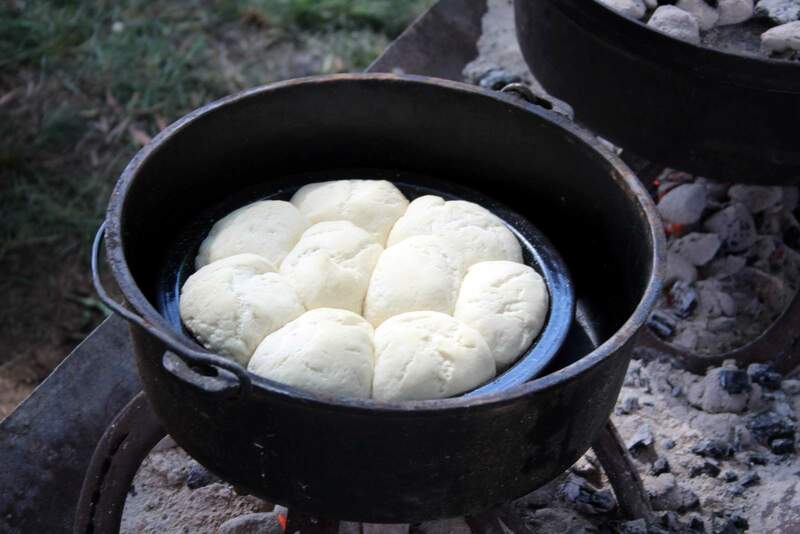 I’m always impressed with the wagon crew members’ prowess at moving big iron pots and Dutch ovens over the campfires and coals, somehow managing to rarely burn anything they’re cooking while working in stifling heat and wearing period clothes. The crews are always busy during the last hour of preparation, so I try to stay out of the way and not ask too many questions. Then, it’s time to head into the extension building for judging. There are 15 judges for the event, three each for beef, potatoes, beans, bread and dessert. I know a few of the other judges, and it’s always a good time to catch up with folks I might not have seen in a while. This year, I sat at a table with LaVina Mars, so we discussed making jam, and Dave Saleh, a past president of the Bayfield Chamber of Commerce. Perry Jefferies informed the judges that we’re judging the authenticity of re-creating cuisine from the late 1800s, and one of the judges joked he’s not that old, so exactly how are we to know if it’s authentic or not? We chuckled at that one. To be truly authentic, she explained, not a lot of spices were used. Each table draws the categories out of an envelope to see what we will judge, and LaVina pulled dessert, so Dave and I were pleased. La Plata County Manager JoAnne Spina, a fellow dessert lover, was a little sad she wasn’t at our table. This year, the featured ingredient for dessert was peaches. The desserts are numbered and brought in, and we judge each entry by its number. This year’s desserts featured two cobblers, one crisp with an oatmeal and sugar topping, a surprisingly moist bread with pecans, and my favorite, a gingerbread with baked peach topping. Judges have a bottle of water and plate of grapes to cleanse their palates between sampling each entry. We rate each entry on appearance, taste and texture. While I liked the gingerbread, the other two judges preferred one of the cobblers, with the top entry going to Harry Baxstrom and his Poverty Flats wagon crew. The gingerbread, made by Durango Cowboy Church, took second, and third place went to Canyon Trails Ranch for their peach crisp. Every entry was delicious, particularly since they’re cooked over uneven heat. I had divided my desserts in half – there are always generous portions for the judges – and went to share mine with Spina and the other bread judges. This also gives me the chance to sample sourdough biscuits and campfire rolls, another favorite. After the judging, we judges get to go enjoy supper with about 400 other folks, and the five wagons serve all of those people in about half an hour, another impressive feat. This is the 15th year for the cook-off, which supports scholarships for local students studying agriculture and related fields, and organizer Barb Jefferies said she hopes the event will be around for many more years.